On Tuesday, during her acceptance speech at the Robert F. Kennedy Center for Justice & Human Rights in New York City, former Secretary of State Hillary Clinton spoke out against torture around the world and also noted that “black lives matter,” reports the New York Daily News. Clinton told attendees that she was proud to have worked with an administration that has been a part of the ban on torture practices. During her speech, the former New York senator also said, “Yes, black lives matter.” The term has come to represent a rallying cry for those protesting police brutality and the lack of indictments in the cases of Michael Brown and Eric Garner, both of whom died at the hands of police officers. 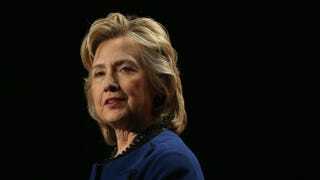 Clinton is considered to be a potential Democratic presidential nominee if she chooses to run.